When you create waste, it is your responsibility to dispose of it properly. Many items can be disposed of in your usual kerbside recycling service or through our waste disposal service. For other types of waste, though, you must go to a special disposal site. The Leicestershire County government provides 14 waste disposal centres, called Recycling and Household Waste Sites (RHWS). The sites are open from 9 a.m. to 4 p.m. from October to March, and 9 a.m. to 7 p.m. from April to September. Each centre is closed on different days, so you can find a waste disposal site seven days a week. Each of these sites accepts a wide range of waste materials. Household waste, including small electronics, plastic, glass, metal, cooking oil and other items, can be disposed of at no charge. Rubble, soil, concrete slabs, roof or floor tiles, bathroom fixtures, and other items will incur a small fee, generally about £3 per 20 litres. Depending on the type of waste you’re discarding, you may need a waste disposal permit. For example, you will need a permit if you’re disposing of asbestos, chemicals or liquid paint, or if you are disposing of waste with a van or a car with a trailer that is at least 4 ½ feet long. You can apply for a permit online on the Leicestershire County Council’s website. Permits are only available to residents of Leicestershire County. 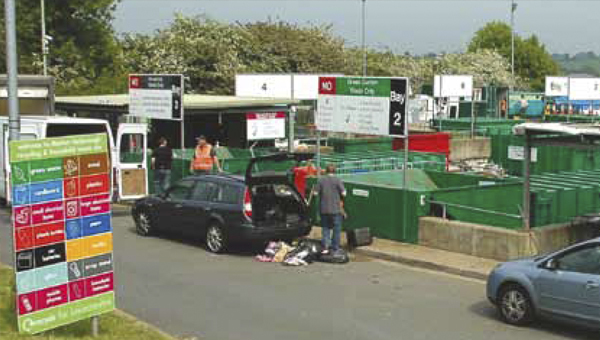 If you’re disposing of commercial or business waste, you have a few different options.You could use your district council’s trade waste service, hire a licensed waste contractor or take your waste to the Whetstone Transfer Station. Keep in mind that there is a minimum charge for disposing of waste, which varies depending on the type of waste you’re discarding.